The Famous Grouse, Scotland’s favourite whisky, is welcoming two new expressions into its family; The Snow Grouse and The Naked Grouse. The Snow Grouse is set to make history by being the first Scotch whisky specially created to be served straight from the freezer. This blended grain whisky is matured in oak casks before being chill filtered to create a light, delicate and vanilla sweet whisky with a uniquely smooth taste, designed to be served seriously chilled. For a whisky to bear the name The Snow Grouse it has to be as unique as the bird it is named after. Living in the highest mountains of the Highlands of Scotland, the snow grouse has been described as “the toughest bird in Britain”. In the summer the snow grouse has a mottled brown plumage, while in winter it takes on an extra layer of white feathers for warmth – becoming completely white – to help it survive in the frozen, snow-covered conditions. Just like the bird itself, this is a completely unique whisky which takes on a whole new character when served seriously chilled. At room temperature this is a beautifully balanced, easy drinking Scotch whisky. Served straight from the freezer, consumers find the whisky has an even more delicate flavour, is thicker in consistency and sweeter than its usual dram. 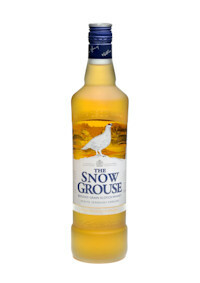 The Snow Grouse is available nationally from The Whisky Shop, Tesco and Asda priced at £17.49. Introducing the world’s first whisky to choose taste over unnecessary packaging. The Naked Grouse is an outstanding whisky, demonstrating the brand’s extensive experience in the art of blending which stretches over a century. This premium blended whisky contains two of the world’s most renowned malts – Highland Park and The Macallan, which are then slow-matured in sundried, Spanish sweet sherry casks – the most expensive in the world. This process gives the whisky an unrivalled smoothness of flavour. Fancy bows and unnecessary boxes have been left behind in order to concentrate on creating a new breed of Scotch that’s sherried, ultra smooth and easy to drink. 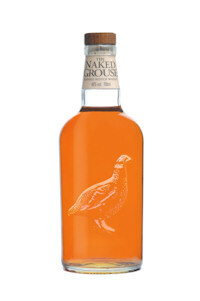 The Naked Grouse is an intensely smooth whisky that can be savoured neat or on the rocks. The whisky can also be enjoyed in simple mixed serves or cocktails such as The Naked Old Fashioned which let the flavours shine through. Pour 50ml The Naked Grouse over cubed ice with two dashes of cocktail bitters and 10ml sugar syrup, stir for 20 seconds and garnish with orange zest. The whisky is available in high end bars and retail outlets such as Royal Mile Whiskies, www.masterofmalt.com, Tesco and Asda priced at £27.69. The Famous Grouse Finest is the founding member of the famous family. The blend was joined in 2008 by The Black Grouse, a distinctive premium blend with a smoky and smooth taste.